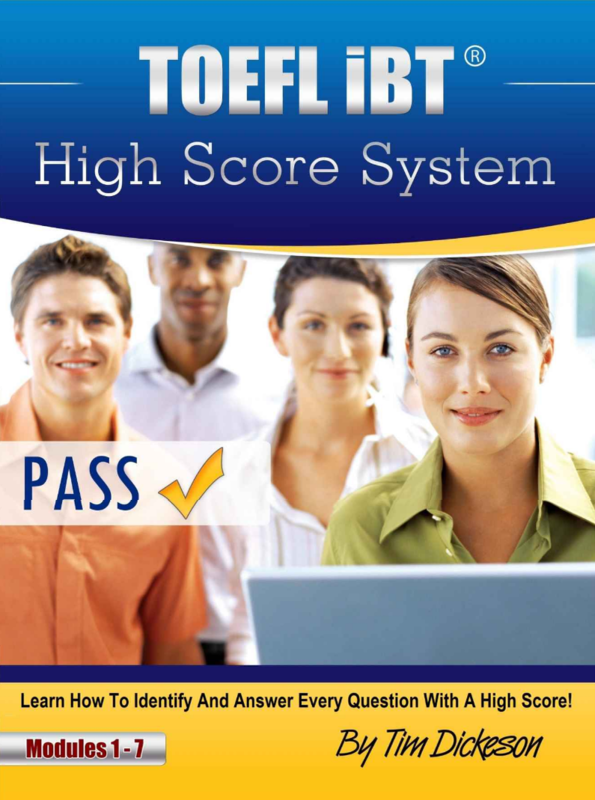 Download TOEFL iBT High Score System: Learn How To Identify & Answer.. This book is based on easy to follow instructions on how to approach the questions on the TOEFL. If you’re someone who wants a high score on the TOEFL exam, then you’re about to discover how to answer Every Question with a High Score! – Learn The Three Parts To A High Scoring Essay Introduction – This will make the start of your essays very powerful! So, if you’re serious about achieving a high score on the TOEFL that you can be proud of… and you want Step by Step instructions without wasting more time preparing – then you need to get a copy of “TOEFL High Score System” right now! Timothy Dickeson will reveal to you the system that he uses with all his TOEFL students who achieve amazing results! I was unsure how exactly to develop my speaking and writing answers in order to obtain a total score of 109, which was the score I wanted. This material explained exactly what I needed to put in my answers by following a simple and clear system. When I took the TOEFL, I knew exactly what I needed to do which made me feel much more comfortable and I obtained scores of 26 and 28 respectively for the speaking and writing sections, and this helped me obtain a fantastic score of 114 in total for the TOEFL iBT. The TOEFL iBT High Score System is for anyone who is about to take the TOEFL test and wants direct instructions for how to identify and answer even- question with a high score. Timothy Dickeson, founder of TOEFLcoach and IELTScoach, is an English teaching consultant and specialist in the TOEFL (Test Of English as a Foreign Language) and IELTS (International English Language Testing System). After realising the difficulties and frustration that many foreign people have with passing the TOEFL and IELTS exams, Tim decided to make it his mission to provide a clear and simple format for preparing for these exams (without the confusion and information overload!). Since then he has taught hundreds of students and is now sharing his proven strategies to increase English fluency and prepare more effectively for the TOEFL and IELTS. The main reason why Tim has been a preferred teacher and consultant for many students and institutes, is due to his simplified explanations and exercises to make sure the student understands exactly what needs to be done. But above all, Timothy has a passion and love of teaching and helping people achieve results so they can continue to pursue their dreams.